This bag is super cute and super roomy! It has so many fun details the picture just doesn't do it justice! With a bag like this you're bound to get stopped with comments like "Where'd you get that bag!?" or "So cute! I want it!" 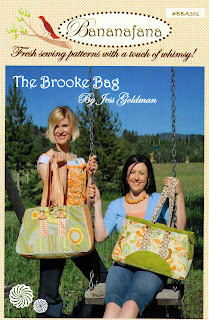 Named after my adorable friend Brooke this bag is just as fun and spunky as she is. Customize it to match your wardrobe just by picking out your own fabric. Couture for sure girl!!! I really love this bag, it's such a good size and so cute! Can't wait to see your next bag, I heard you had one in the makings!